Santorini is one of the most popular tourist destinations in the world. It’s curious, then, that so few people know of the archaeological gem sitting at the north end of this gorgeous island. Akrotiri is a Bronze Age settlement that was basically decimated in 1627 BC when Thera, the volcano it sits on, erupted and the people fled. Thankfully, the eruption caused excellent preservation of the site, which visitors can easily visit today! 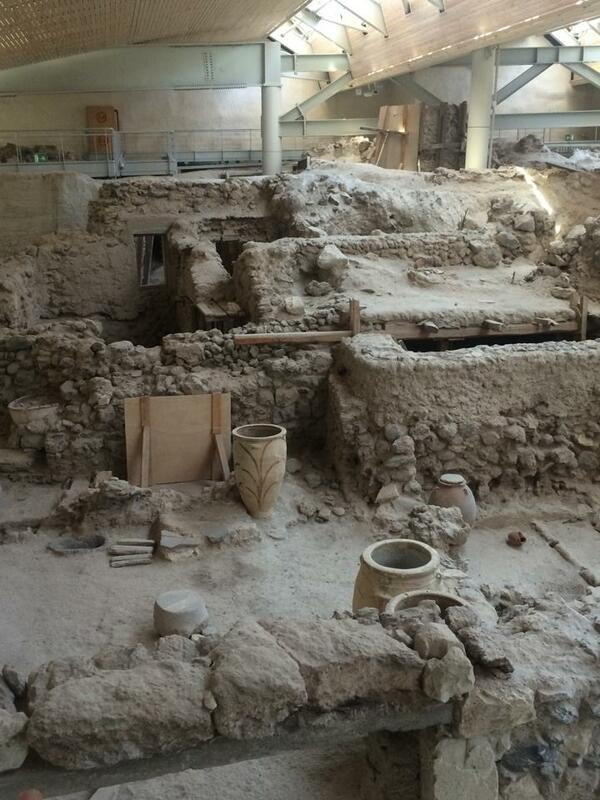 The first people came to Akrotiri during the Late Neolithic Period (at least around 4000 BC). A settlement was later established during the early Bronze Age (around 3000 BC) and had grown to be one of the largest urban ports in the Aegean by the early Late Bronze Age (2000-1700 BC). The placement of the settlement was strategic, as it allowed for commercial relationships with Greece, Crete, Cyprus, Syria, and Egypt. Basically, they made a lot of money. The wealth is reflected in the buildings in the town. Many are multi-floor, have sophisticated draining systems (think indoor plumbing), and elaborate frescos. The town was so advanced that some scholars think it could be the “Atlantis” that Plato wrote about – a great and wonderful island that disappeared in a day. And Akrotiri very well could have been “Atlantis”, since Akrotiri is a modern name! Crazy, right!? Speaking of the disappearance of the town: Akrotiri was pretty prone to disaster. First, there was a string of earthquakes leading to a pretty major one in the later part of the 1700s BC. The earthquakes caused citizens to flee and rebuild time and time again. Then, Thera erupted in 1627 BC, causing the abandonment to become permanent. Scholars are fairly confident that Akrotiri was indeed abandoned before the eruption occurred, as no human remains and few valuables were found at the site. The citizens probably left modern Santorini for a nearby island. 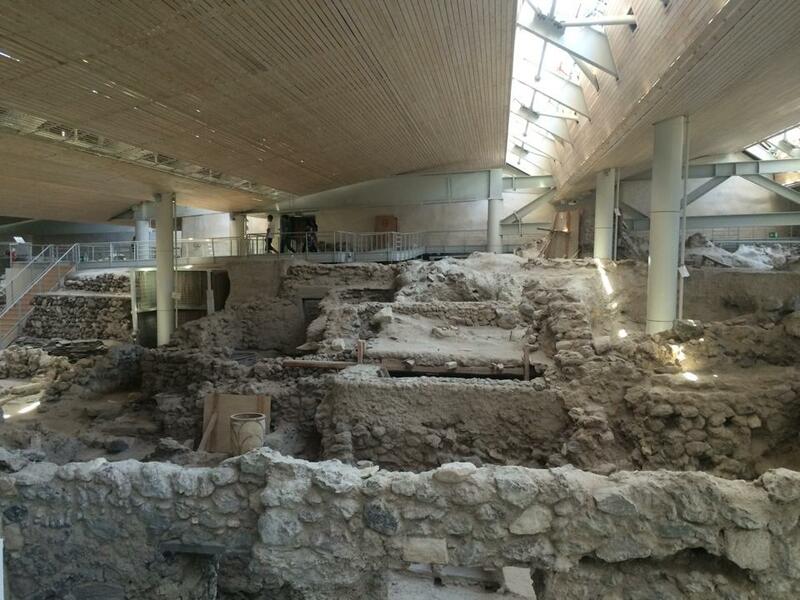 Excavations at Akrotiri started in 1967 and continues through today. Santorini is very windy and Akrotiri sits at the top of a large hill, so the archaeological team decided to build a large, covered structure around the site to protect it from the elements. At one point, the roof collapsed and the site was closed for awhile for some major repairs. It is now reopened and greets visitors almost every day. Akrotiri is pretty easy to get to – just hop on a bus or take a taxi from Fira. I do not recommend walking as it is a steep haul to get up to. The site is open almost every day of the week, being closed on Mondays during the off-season. The site opens at 8 AM and stays open til 3PM during the off season and 8PM during peak season. I recommend calling the site (+30 22860 81366) to make sure it is open for visitors before making the trip up. Entry is €12, with a reduced cost of €6 (ask who qualifies for this when you visit) and free for EU students and those under 18. You can also get a 4 day ticket that allows access to a number of area archaeology sites and museums for €14 (reduced €7). 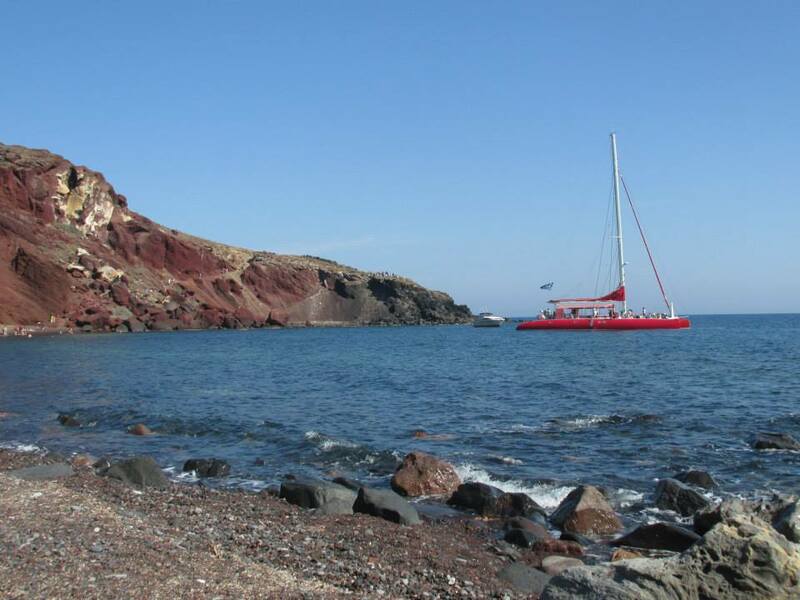 Plan to visit the Red Sand Beach while you’re visiting Akrotiri. It’s only about a 10-15 minute from the visitors lot. The Red Sand Beach is one of the prettiest beaches I’ve ever visited and the water stays a wonderful temperature for swimming year round. The sand gets its color from the volcanic eruption that covered Akrotiri. There are also some lovely restaurants on the walk to the beach where you can grab lunch. I cannot recommend visiting Akrotiri enough and am so sad more people aren’t aware of this amazing site! Santorini is a gorgeous island, and Akrotiri is a perfect addition to a trip to the island. PS: Like this post? Check out my other #SiteSunday posts on The Sagrada Familia, Delphi, , Delos, and the Athenian Acropolis. Planning a trip to Greece? Here’s my post on my visit to the Mainland and Cyclades Islands.